The Mid-Atlantic Regional Spaceport and, in the background, NASA's Wallops Flight Facility as seen in September 2012. The Mid-Atlantic Regional Spaceport (MARS) is a commercial space launch facility located at the southern tip of NASA's Wallops Flight Facility on Wallops Island in Virginia, just east of the Delmarva Peninsula and south of Chincoteague, Virginia, United States. Launch pad 0A with Antares rocket. At left is a water tower for supplying water for sound suppression. The Mid-Atlantic Regional Spaceport has two active launch pads. A third was proposed, but never built. Launch pad 0B with Minotaur V rocket in September 2013. Launch pad 0B (LP-0B) became operational in 1999,  and was subsequently upgraded with the construction of a mobile service tower, which was completed in 2004. It remains active, and is currently used by Minotaur rockets. 12 28 October 2014, 22:22  Antares Cygnus CRS Orb-3 Pad 0A Failure  Pad damaged by explosion and fire. ^ Wade, Mark. "Wallops Island LA0A". Encyclopedia Astronautica. Archived from the original on 2008-11-20. Retrieved 2009-01-21. ^ "Launch Tower Demolition". GMB. Archived from the original on 2009-02-21. Retrieved 2009-01-21. ^ a b Kyle, Ed (2011-05-14). "Taurus 2". Space Launch Report. Retrieved 2011-12-19. ^ "Facilities". Mid-Atlantic Regional Spaceport. Archived from the original on October 16, 2008. Retrieved 2009-01-21. ^ "Launch Pad 0-B" (PDF). Mid-Atlantic Regional Spaceport. Archived from the original (PDF) on July 4, 2008. Retrieved 2009-01-21. ^ Wade, Mark. "Wallops Island LA0 HAD". Encyclopedia Astronautica. Archived from the original on 2008-11-20. Retrieved 2009-01-21. ^ Botelho, Gerg. "Unmanned NASA-contracted rocket explodes; damage is 'significant'". CNN. Retrieved 2014-10-28. ^ Foust, Jeff (2014-11-21). "Virginia May Seek Federal Funds for Wallops Spaceport Repairs". Space News. Retrieved 2014-12-01. ^ Leone, Dan (May 15, 2015). "With $2 Million Left on Wallops Repair Bill, NASA and Virginia Look to Orbital ATK To Dig Deeper". Space News. Retrieved July 19, 2015. ^ "Completion Of Repairs at the Mid-Atlantic Regional Spaceport Launch Pad 0A". vaspace.org. September 30, 2015. ^ Malik, Tariq (17 October 2018). "Rocket Lab Picks Virginia Spaceport As US Launch Site for Small Satellites". Space.como. Retrieved 18 October 2018. ^ "Rocket Lab | Our Launch Sites". Rocket Lab. Retrieved 2018-12-30. ^ a b c Wade, Mark. 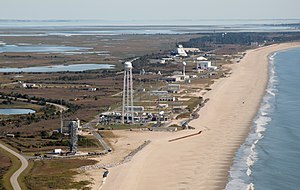 "Wallops Island LA0B". Encyclopedia Astronautica. Archived from the original on 2011-11-15. Retrieved 2011-12-19. ^ Tennant, Diane (22 Aug 2008). "NASA destroys rocket shortly after launch at Wallops Island". Virginian-Pilot. Retrieved 2 November 2014. ^ "Antares Maiden Soar Pierces Virginia Sky and delivers NASA SmartPhone Pioneer Nanosats to Orbit - Universe Today". 24 April 2013. Retrieved 12 September 2018. ^ "ORB-1: Antares successfully launches Cygnus en route to ISS – NASASpaceFlight.com". www.nasaspaceflight.com. Retrieved 12 September 2018. ^ "Northrop Grumman Corporation". Northrop Grumman. Retrieved 12 September 2018. ^ Beutel, Allard (3 April 2015). "NASA Cargo Launches to Station Aboard Orbital Resupply Mission". Retrieved 12 September 2018. ^ "Antares Launch Postponed to Oct. 28 – Orbital ATK". blogs.nasa.gov. Retrieved 12 September 2018. ^ "Teams investigate failure of unmanned rocket off Virginia coast". CNN. ^ Beutel, Allard (17 October 2016). "Orbital ATK Launches NASA Resupply Mission to Space Station". Retrieved 12 September 2018. Wikimedia Commons has media related to Mid-Atlantic Regional Spaceport Pad 0A and Mid-Atlantic Regional Spaceport Pad 0B.